A place of humble creativity with a giggle or two thrown in. 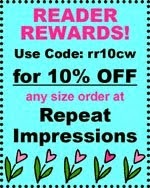 Hi there blog friends and welcome to a very special blog hop for Repeat Impressions and The House That Stamps Built! 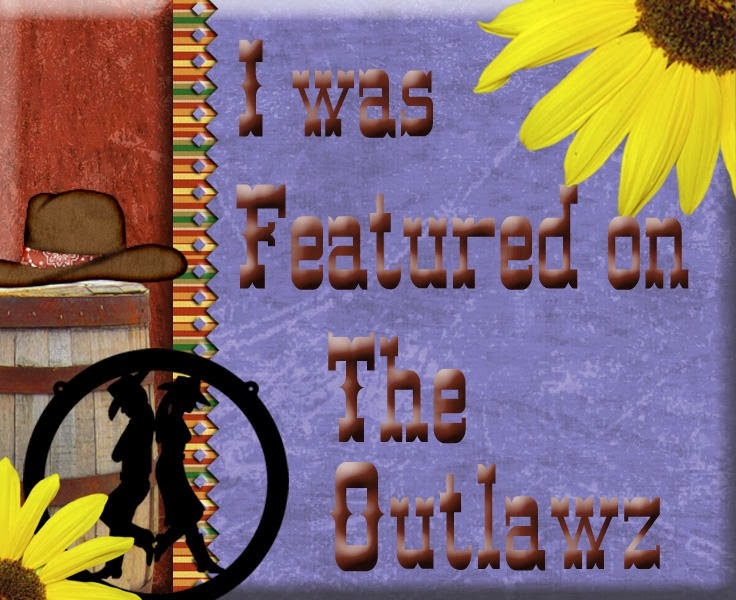 If you came here from the super talented Kathy's blog, you're in the right place. Today we will be showcasing some incredible new dies. 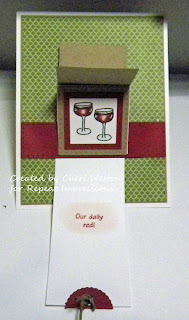 These dies are specifically made for the Repeat Impressions Flip Stamp sets and oh, what fun they are to use. They can be used for in so many other ways with card making and scrapbooking too. There are two different die sets. One is stitched edges and the other is fancy edges. Two lucky people will win a set of these dies and all you have to do to get into the drawing for them is to comment on as many blogs as you'd like chances to win. 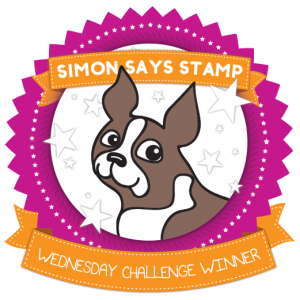 For instance, if you'd like 9 chances to win....leave a comment on each Rock Star blog, as well as The House That Stamps Built blog. 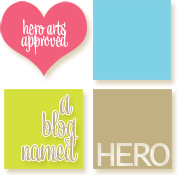 If you visit 3 blogs and leave a comment, you'll be entered in the drawing 3 times. So, for as many blogs in the list that you visit and leave comments on, that's how many entries you will receive. You have until 5 p.m., July 25th to complete the hop and enter the drawing. The winners will be announced July 27th on The House That Stamps Built blog and Facebook page. Here is the list of blogs for you to visit and comment on in order (so you don't miss any). 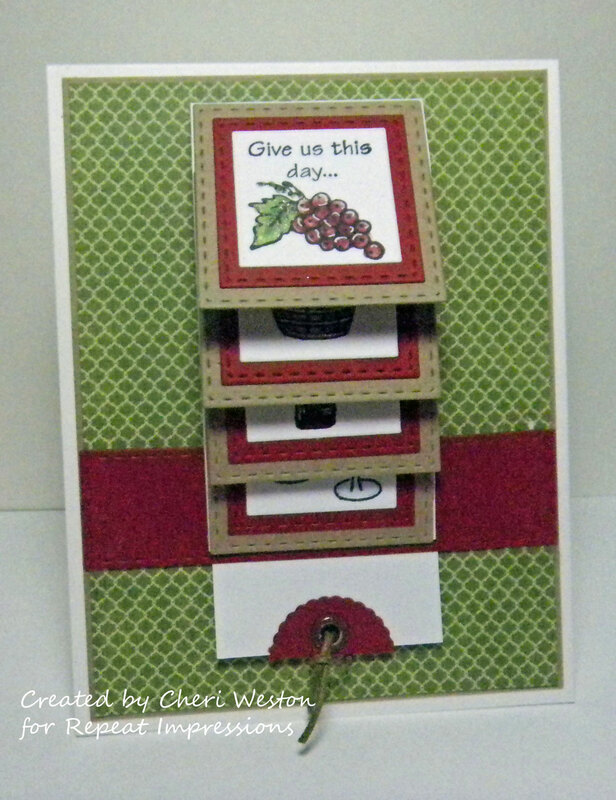 I am using the Stitched Edge die set for this card and the flip stamp set I'm using is from the "Funny Bone" list RI#7506-W "Daily Red". The link to all the flip sets that Repeat Impressions carries as well as pre-cut and scored papers and instructions for making these cards is HERE. 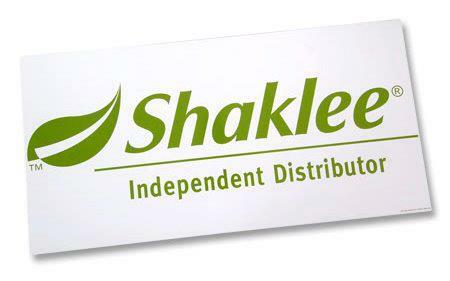 The link to the new dies can be found HERE. 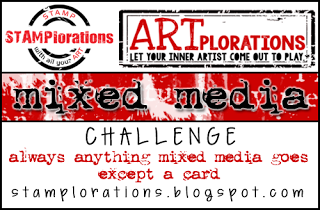 So, now....it's on to my incredibly talented friend, Patti J's blog for more inspiration and another chance to win. Thanks so much for stopping by...I look forward to reading your comments! Good luck I hope you win a set of these awesome new dies! I LOVE these die sets - especially the stitched set. It would be so much fun to create flip cards with these. Love your beautiful card! I can almost taste that 'red', my friend! What a cute card! Great work with the flip dies - this was a fun project! Neat card! Love this idea!! Thanks for sharing!! Great waterfall, flip card. The stamps in this set are so neat and I like the paper you used! How cool a card this is - would be a great card for wine lovers. Love your cards! What a great idea! What an incredible card! These new dies are gorgeous! Thanks for the blog hop! Loving those new dies! 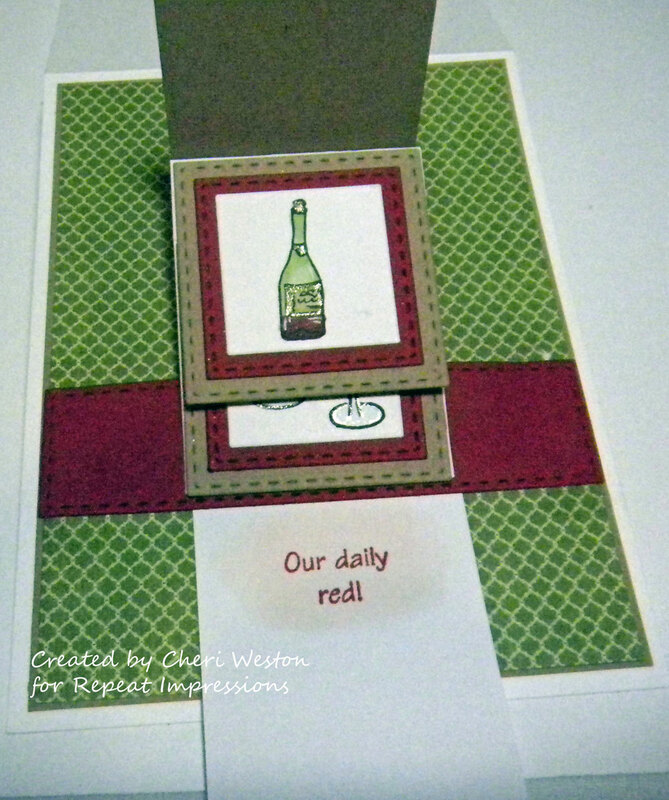 Cute card...our daily red! Great colors. Fabulous flip card!! 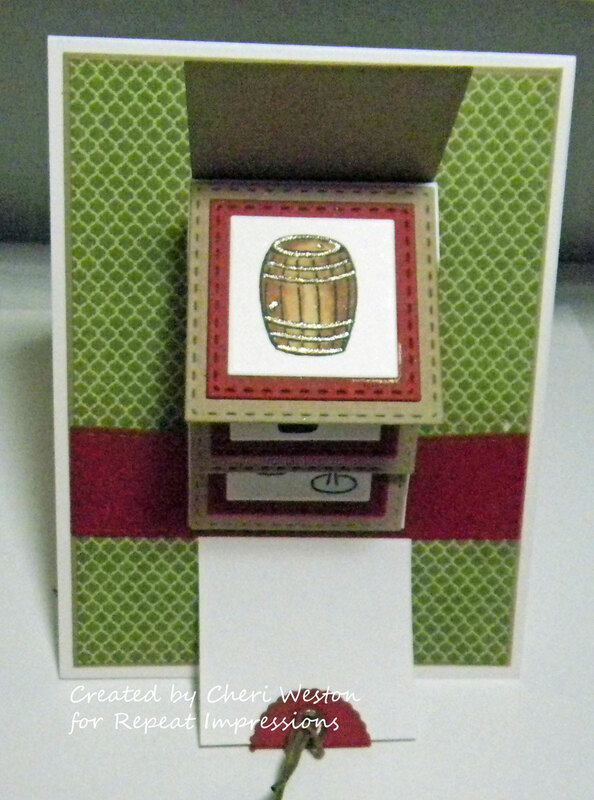 I definitely love the stitched flip card dies!! 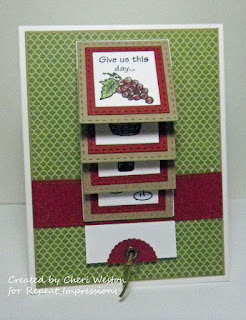 I love the idea of these flip cards!! have to try some time! Great card! 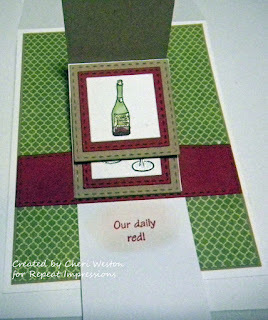 Love your color combo; it goes perfectly with the wine theme! Hope you were still sober after making this super flip card SS. We could have so much fun doing this together lol. Another technique to add to my list to try. 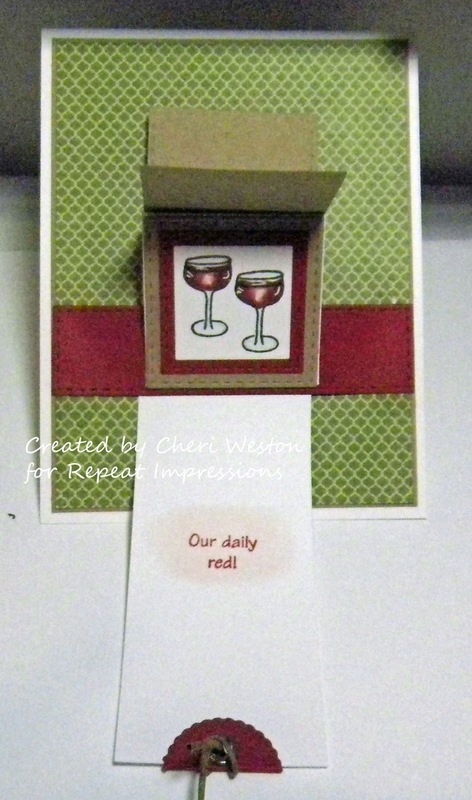 Fabulous job on the wine flip card, Cheri! What a perfect color combination of papers for this set. Nice touch highlighting the sentiment on the pull tab too... never would have thought of that! You rock! I'm a sixty "something" boomer who saw a handmade card one day and thought "WOW! I want to do that". Sooooo, here I am. (Secret) When I was a little girl, paper dolls were my favorite toy; I must have had hundreds of them and I used to cut the models out of my mother's old catalogs and make clothes for them with some other pages from the ladies clothing photos. I married a Maine (iac) man and now live here in the beautiful state of Maine, however, I was born and raised in the beautiful Adirondacks of NYS. I'm devoted to my wonderful husband, my kids and my grandchildren. I'm blessed in so many ways and I count my blessings every day. All content here (including text, photographs and designs) is copyright protected. I am happy to share my creations with you. They are here for your enjoyment and personal inspiration only. They may not be copied, captured or otherwise used in any way for publication, contest entry or sale without my express permission. Thanks for your understanding. Every card needs a touch of cat!